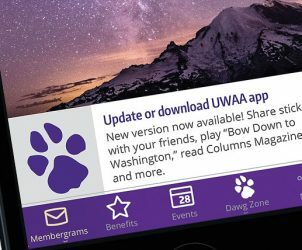 Download or update the UWAA member app and put membership at your fingertips. Be hassle-free. No more digging in your wallet for your membership card. The UWAA app lets you take your virtual card with you wherever you go. Be connected. Membergram alerts, event postings and calendar updates keep you up-to-date on all our member activities. Be a deal finder. Before you make that purchase, check the app! UWAA members have access to discounts at dozens of businesses, including Husky Authentic and the University Book Store. Be a superfan. Enter the Dawg Zone! Share UW stickers and play “Bow Down to Washington,” the Husky air raid siren and more! We have recorded unique sounds from the UW’s three campuses. Visit the app and navigate to the Dawg Zone section. Listen to the “Where am I?” sound and complete the form below with your answer to enter to win a $50 gift card from University Book Store! The October contest is now closed! One entry per person. Winners will be randomly selected from correct entries received. We will contact you at the email address you provide. Employees of the UW Alumni Association are not eligible to win. Apple, the Apple logo and iPhone® are trademarks of Apple Inc., registered in the U.S. and other countries. App Store is a service mark of Apple Inc. Google Play is a trademark of Google Inc.
Congratulations “Where am I?” contest winners! *Special thank you to Harold Johanson, ’68 for permission to use his recording at the Gordon Stuart Peek Foundation Carillon dedication on April 5, 2018.